Though I spend plenty of time at the foot of the stage, I don’t usually care much for live recordings: I prefer the perfection of the studio to the roar of the imaginary crowd, and poor sound quality bothers my ears. But every once in a while, when there’s a good engineer at the sound board, something truly special results. Such is the case with Red Molly‘s strong first full-length album Never Been To Vegas — which, when added to their four-song in-studio EP, is the sum total of their recordings. And, with the exception of a few previously-sung notables by Red Molly dobro player Abbie Gardner, every single song on these albums is a coversong. 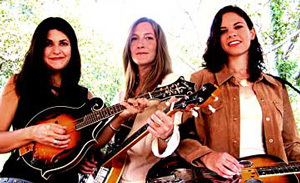 The three folksingers that comprise Red Molly — Gardner, bass player/mandolinist Carolann Solobelo, and banjo/guitarist Laurie MacAllister — met around covers, so it’s no surprise that their entire recorded output consists of them. Formed from the early morning remnants of a latenight songcircle high above the darkened mainstage of Falcon Ridge Folk Festival, the trio returned to the festival two years later to win the highly-competitive FRFF Emerging Artist showcase. (Full disclosure: I’m crew chief for the Falcon Ridge Folk Festival teen crew). Since then, the girls of Red Molly have toured with the other 2006 showcase winners, opened for such luminaries as Jonathan Edwards and John Hammond, and come back to Falcon Ridge as featured performers, wowing crowds and winning admiration from fellow musicians with their sweet harmonies and full acoustic sound. Throughout, they’ve been playing covers — banking admiration for such time as they might return to either their own solo work, or a fuller existence as the rarest of American folk creatures: the folk group. Mostly, Red Molly’s interpretations lean towards the Americana end of folk music — coverchoices include Gillian Welch, Hank Williams, and old traditional folk/gospel songs such as Darlin’ Corey and When The Roll Is Called Up Yonder. But regardless of subject, their tight crystal-clear harmonies and brightstringed musicianship bring each song forward as a gift to be shared, a glittering gospel. Today we feature a trio of songs from the folktrio’s Never Been To Vegas, with kudos to engineer Dae Bennett for changing my mind about live recordings, even if this one turns out to have been recorded in a studio, not a coffeehouse. Don’t forget to check out the bonus songs below for a sweet pair of covers from their self-titled EP, and a wonderful version of You Gotta Move by Abbie and fellow 2006 Falcon Ridge Folk Festival Showcase winner Pat Wictor. Support these fast-rising, red-wearin’ women by buying Red Molly, plus solo albums from Abbie, Laurie, and Carolann, from CD Baby via the Red Molly website. While you’re there, follow the link to pick up this year’s Naked Folk Calendar (the girls of Red Molly were the November 2006 pin-up); all calendar profits go towards health insurance for struggling folk musicians.